Just a little beetle for the LPC. It's all ready for formatting, but I honestly didn't want to finish it. So yeah! Enjoy. There might be more monsters coming. Note that it has walking animations plus attacking (two rightmost frames on each row). edit: added a hole from which they might spawn per request. 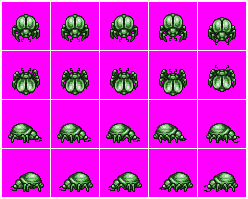 Bug looks awesome, and asks to be recolored for fire/ice/poison bettles. May I ask a favor? For us to be able to integrate this monster in our game, we need a den which spawns these monsters. Will you be so kind to consider creating one? It could be a simple mound. PS: we absolutely have no graphic designers among us. What we can do is to split graphics and recoloring. I even did the recoloring, if you wish to include them in your post, please do so, I dont require any credits as 99.99% is your work. Yes, very glad to see another monster sprite! Cheers Stephen, for this and other artwork which I'm using in my game. They are really high quality stuff. @cemkalyoncu: I'll give it a shot tomorrow. @tshirtman: Glad to hear it's useful! Looks very nice. Any chance to get a death sprite? @Ablu: will this do? I think Redshrike can do alot better. @cemkalyoncu: How shall we credit you in our AUTHORS file? @Ablu: credit Redshrike, if you really would like to include me as well (I dont ask for it), just my name would be enough. @cemkalyoncu: and what license shall i list? Alright. cool. Added it to the game. Do you plan to do a death sprite for the other 3 directions as well? Well all death animations are single sided. I am glad that I pulled that out. But if you really need them, I am willing to give it a try. can the beetle going in the north direction please not look like it's going up a wall lol. Other than that it is great! 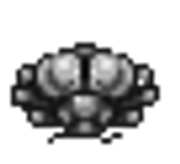 I've added a very simple hole/spawn sprite thing to the listing. Is that what you were after? Except for its size, its exactly what I was looking for. But it seems simple scaling to 2x works perfectly fine. @Ablu: I did the death for othersides. But north facing one turned out to be pretty bad. Thx a lot. just tried and works fine. up facing looks a bit strange indeed. But fine for me atm. Thanks a lot! I gotta say, all this LPC stuff looks fantastic. Good job everyone! I have no idea how or why a mace animation made it's way into this post but I'm going to try to turn it into an LPC asset (weapon animation sheet) with a bit of elbow greese and determination! Wish me luck! William, we already have a mace animation somewhere. There's an oversized animation on makrohn's Universal LPC spritesheet but it looks nothing like this mace. Plus, this would probably fit in a 64x64 square decently so it wouldn't need the oversized animation. I think I'm still going to try this tomorrow. Thanks for the heads-up though. Ah, yeah, I'd sort of forgotten about this mace. I drew it up quickly for someone in the IRC during the contest and didn't feel like it deserved its own entry, so I just tossed it in this one to make sure that the formal licensing was in order. It should have the poses it needs to be put on the original slash animation--I just didn't want to take the time to do it myself at that point. I can produce weapons with those two/three poses pretty quickly, but the time it takes to add to the sheet is a bit more bothersome. @cemkalyoncu: That is true, but it is indeed a different mace (by Daneeklu) so it wouldn't be totally redundant anyway. I found the original layout less than useful for my purposes. 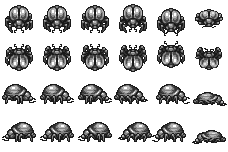 I changed the tile size to 38x38 and included the death animation on the right side. I resized and slightly moved varios tiles to better looking positions, nothing new. Don't credit me, credit the author and contributors as they've asked.